Get ready for the best communication app on the Android platform – SFERA. Developed and designed by Cristian Sfera, this app allows the users to share and exchange information between each other with simple and easy navigation. The user interface is perfectly clean and tidy and the graphics aesthetically pleasing for any eye. SFERA will help you to never forget or lose any contact information and will prevent you from sending expensive SMS and emails. You will have to create your own profile and log in so you can note your personal information. Write your names, your surname, email, number and upload you profile picture. When you’re done, with a simple click on the “share” button, you can send your info to whomever you want to. Besides sending, you can receive the same details of other users and always be notified when that happens. The received info can be uploaded to your personal address book where you can always have the access. The best feature of this app is that the users can send files up to 5MB and write a message within too. 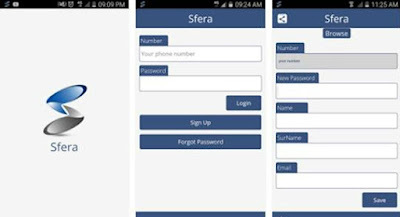 Rapidly sharing info, SFERA can be downloaded for free from Google Play.